ALBANY – Br. Aloysius Urban Myers (born John Francis Paul Myers) died on Thursday, May 12, 2011 at Riverview Hospital in Red Bank, NJ. He was born on August 16, 1930, in Manchester, New Hampshire to Arthur J. and Gertrude Boyle Myers. His early education was at St. Joseph’s in Manchester, and he entered the Juniorate of the Brothers of the Christian Schools on August 30, 1947 in Barrytown, New York. Brother entered the Novitiate in 1949 and professed First Vows on September 9, 1950. He received a Bachelor of Science in Education from Manhattan College in 1951. Br. Aloysius began his teaching career as a Prefect at Hillside Hall in Troy in 1951. He then was a teacher-prefect at La Salle School in Albany for one year, and assigned to Christian Brothers Academy in Albany beginning in 1952. 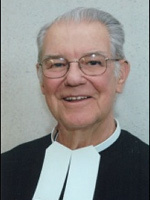 In 1957 he was appointed principal of the junior high at CBA, and remained in that position until he moved to the high school division in 1967. In 1969 he was assigned to Bishop Bradley High School in Manchester, NH where he taught and directed the Brothers Community until 1974. In September, 1974, he returned to CBA Albany where he was Director of Guidance until March of this year, when he retired to De La Salle Hall in Lincroft, NJ. Besides his parents, Br. Aloysius was predeceased by four brothers and one sister. He is survived by one brother, Robert Myers of Manchester, NH, and 19 nieces and nephews; his religious community, The Brothers of the Christian Schools; and the many students he worked with over his 60 years in active ministry. In lieu of flowers contributions may be made to the Brother Al Scholarship Fund, Christian Brothers Academy, 12 Airline Drive, Albany, NY 12205. Viewing will be held on Sunday, May 15 and Monday, May 16, 2011 from 5 pm until 8:00 pm, at the Christian Brothers Academy, 12 Airline Drive, Albany, NY, 12205. The Mass of Christian Burial will be celebrated at the Church of St. Pius X, 23 Crumitie Road, Loudonville, NY at 10:30 am on Tuesday, May 17. Interment will be in St. Agnes Cemetery, Menands. Arrangements have been entrusted to the Hans Funeral Home, Albany. To leave a message of condolence or view or print a prayer card please visit www.HansFuneralHome.com . Offer Condolence for the family of Brother Aloysius Myers, F.S.C. Brother Al was a good man, a good teacher, and a great friend. Brother Al was a great guy all around. He was a huge inspiration and help to all CBA students and Alumni. My prayers are with the CBA community. May he rest peacefully. I remember him as a kind, gentle soul during my days at Trinity High School (formerly Bishop Bradley HS) in Manchester, NH during the years 1970-1974 – he served as a guidance counselor during this time. God bless him for all these many years of devoted service in Catholic education! May he rest in peace. Bro. Al was a joy to work with during my years as President of the Ladies Auxiliary. He was a great person and a good friend as a guidance counselor to my two sons. He always had a smile on his face and time for everyone. Frank and I will miss you. A truly remarkable, inspirational educator and human being. Brother Al is synonymous with CBA. Thank you for everything, Brother! Live Jesus in Our Hearts Forever! Brother Al was a special person to many families and will be missed by all. Brother Al was there for my dad’s graduation in 1958 and mine in 1997. Now sadly, they are both gone. A man of integrity who added value every minute he was a part of the CBA family. I always looked forward to seeing him and shaking his hand, even though it hurt a little bit. I feel privileged to have known him. Brother Al was a great bridge between experience and youth, new and old. He was able to make the transition in relating to the youth of his generation, and the generation of today. May you rest in peace Brother Al, and thank you for your contribution to all CBA students, especially my son Corbin. Brother Al puts the sparkle in light. He was/is an extraordinary man! His True Blessings Abound! Brother Al was not not only an upstanding member of the CBA community he touched the lives of everyone he knew. He taught my father, my brother and I and we, like everyone else in the CBA community share fond memories of him and his work. May you rest in peace Brother Al. Thank you for everything. Brother Al was a great person. Always had his door open for you and was willing to help in anyway possible. His presence in our world will be missed. And so will that FIRM handshake! Bro. Al was always the voice of of reason during my days at Trinity (1970-1974). He was a great presence at the school and a good friend. The world is poorer with his passing. It was an honor to know and work with him for the benefit of my family. Brother Al was one of the most influential people in my life. He taught me discipline early in my life which has served me well since. He was a teacher, but more than that he was a friend and had a genuine interest in your success. He was my first teacher at CBA in the 7th grade and would always go the extra mile to give extra help when needed. Saturday morning extra help classes! I still have a postcard from 1956 that he sent me from NH over the summer vacation recess. He was an extraordinary person and educator. Rest in peace Bro Al. You will never be forgotten. I graduated before Brother Al came to CBA so I never knew him as a teacher or adninistrator but knew him for many years as a friend. Mat his soul rest inpeace. John “Brother Al” Myers was a special person. Being both a nephew and student of his, I can assure everyone that I experienced great pleasure of finally being able to return his firm handshake without wincing. Not only was his office door always open to everyone, but his heart was as well. He came from a large family that he loved, but his devotion was to CBA and it’s students. I will miss him for not only being my father’s brother, but for showing me how someone deserves respect throughout their life. Brother Al taught me and my deceased brother how to become MEN. May the mercy of the Lord be with you and may you rest in peace with the Lord. You will be missed by all. Brother Al was a kind and gentle man. I will always remember him. He always had a smile and was ready to help any student any time. I would recalled many of his words during my 40 years as a teacher. May he rest in peace in the arms of the Lord. So much can be said of Brother Al, by countless students, alumni, benefactors and friends. To me, I believe the best thing to say is simply, “thank you”! CBA has been blessed throughout its 150-year history with giants among its staff members of De LaSalle Christian Brothers, lay faculty, coaches, military instructors and adminstrators who have profoundly influenced a generation (sometimes two) of young men. Brother Aloysius Myers was a mentor and role model who was bigger than life but who always deflected attention away from himself. We can be comforted in our sorrow at his passing by the confidence that he will be working as hard for us in heaven as he did here on earth. Bro. Al was a tremendous asset to the Christian Brothers Community and will be missed by all. He was truly a great man who was dedicated to education and youth. We meet certain people as we mature though life that guide, inspire and influence us to do the right thing, teach us good values, and help guide others as we were guided. At a young age, other than my parents and some teachers, Brother Al was one of those people. You could go into the guidence office anytime, get that strong handshake, talk with Brother Al and leave feeling better then when you went in. Brother Al was not only an upstanding member of the CBA, he touched the lives of everyone he knew inside CBA and out. May you rest in peace Brother Al. Thank you for everything you have done for CBA, my Dad, Ray and I.
Br Al was a great Guidance Counselor to my son(2000) when he was at CBA. I could always count on Br. Al. He is going to be missed very much.Rest in Peace Br Al .Thanks for all you did for my family. Even though i didint know him well i consider him my friend. i know that he did alot for this school and i thank him for it. even though i never met him, brother Al must have been a great man to devote more than fifty years to the school. I will never forget Brother Al even though I have not known him for too long. It was a tragic to hear that he passed away. I’ll keep him in my prayers everyday. Brother AL was a very special person to CBA, and all of the students Brother AL will be missed by everyone. We are in the holy presence of God. Rest in peace and may his soul reach heaven peacefully. brother al was a very great man. i did not know him too well but what i know about him is that he was a very great brother. we will all miss him. Brother Al was a great inspiration to our school. He came to all the sports games he could. He was very generous and supportive. It is sad to say goodbye for all of us. I especially feel bad for all the teachers and students who were really close to him. Although I did not know him very well It is still very sad for me. Brother Al was a very nice man who devoted his life to Christian Brothers Academy. Brother Al will be deeply missed from CBA students teachers and alumni. brother Al my prayers are with you everyday. Brother Al set the standard high – for students and faculty alike – and did so with kindness, compassion and sincerity. He was a remarkable role model for all of us. Peace for his soul, and the CBA family he brought together through the years. Brother Al was truly an inspiration to many. He will be sadly missed. He gave me strength and the drive to do my best. I have to agree about that handshake! Brother Al´s dedication and commitment to CBA enriched the lives of all people who knew him He will be greatly missed. May Brother Al rest in peace for a life well lived! Brother Al, I will always cherish our afternoons together as the kids dismissed from the school. We sat together on what we called the front porch and said good night to all the kids as they left the building. I always choked up as each and every kid came over and hugged and kissed you good night. Then in the morning they would come in and hug and kiss you again. They loved you Brother Al and so did I . You are CBA and will always be CBA to me. I love you and know that you are now in the arms of God. Brother Al was a straight forward, kind and compassionate individual who genuinely cared about about the students and was respected by all. Thanks for your great work, Brother Al, and rest in peace. Fr. Emmett Gavin, O. Carm. Brother Aloysius taught me in th 7th grade in 1954-1955 at CBA Albany. He was the first De La Salle Christian Brother I ever knew and he and the those who followed changed my life. What a great and good man and teacher he was and what remarkable role models the FSC Brothers were for me and still are today. I will always be grateful. Brother Al, We met when I started at CBA with the 1st 7th grade class and continued our friendship up to this day. I could always look forward to receiving your Xmas card each December (even Dec. 2010). I will have fond memories of my days at CBA and the friendship with you. Rest in peace Brother Al. Brother Al.. the best teacher I will ever have in my life. Thanks for giving me confidence to stay positive. I began my education at C.B.A. as a seventh grader in 1952, Brother Al’s first year. What a teacher, what a man! Brother had standards, did he have standards. Those who were fortunate enough to begin their education with Brother Al had a measure to live up to both as students and men May God reward him with His holy presence .Thank you, Brother Al. Sleep sweet in the arms of God, Br. Al. There will always be an empty spot in the collective heart of the CBA family. The memories will be long cherished, the guidance long remembered and the love you shared will be everlasting. Brother Al you were an inspiration and a positive force to my 6th grader, Joey Scrima. You will truly be missed everyday. You will be in our hearts always. Thank you, Brother Al. Brother Al was a great teacher and inspiration to me and many of my classmates . In addition to maintaining high standards for his students , he was always genuine, supportive, understanding, and very fair–overall, a wonderful human being. Br Al. was CBA may he rest in peace. The entire Van De Loo Family will be forever grateful for all he has done for us and so many others. I speak for many CBA alums as we gather to thank Brother Al for his contributions to our incredible school, and the tremendous impact he had on thousands of students. He was a legend, and those both within and outside the CBA community truly embraced Brother Al for guidance. It was amazing when college admissions professionals would come to CBA, they would beeline for Brother Al, demonstrating how well respected he was in higher education. For me personally, I will never forget the strong grip Brother Al had, nor the conversations we had about applying to colleges. His sense of humor was contagious and parents, faculty and students all thought the world of him. Thank you Brother Al for all your guidance, friendship and support, Heaven just got one heck of a Guidance Deparment Chairman! Rest in peace. I will never forget the years teaching at CBA. Br. Al was a big part of it. May Jesus give him a hug for me until I can shake his hand in God’s Kingdom. Br Al was a tremendously positive influence to me and my classmates. We at CBA were truly blessed to have known you and benefited from your encouragement, commitment and fairness. You will be in my thoughts and prayers.Rest in peace. Brother Al was a great man and will be sorely missed. Rest in peace my friend! Brother Al navigated CBA students, parents and faculity thru strong and turbulent seas to calm ones. He showed quiet strength and taught us all how to live, with diginity, respect and acceptance. We all have been touched by him in a positive way and will carry his spirit into the future. A smile, a jolly rancher, and just a glimpse of him, is all you needed to make your day brighter. Brother Al was such a great man who touched the hearts of all who he came in contact with and changed the CBA community forever. Brother Al was not only a brother and a teacher, but such an incrdible man and a friend. He greeted all CBA students at the door and took pride in everything he did at CBA. May he always be an inspiration to all and may he live on forever. Brother Al will be remembered by everyone and will never be forgotten and will always hold a special place in our hearts. St. John Baptist De Lasalle, Pray For Us. Live Jesus In Our Hearts, Forever. May you rest in peace, Brother Al, and may we all someday meet again. We all love you so incredibly much, and please stay by our side through this difficult time of your loss, and through our incredible journey of life. Once again, Rest In Peace, always and forever. and for the final time, St. John Baptist De Lasalle, Pray For Us. Live JEsus In Our Hearts, Forever. RIP. Brother Al will be missed by us all. We can feel privileged to have those great memories of him. A man who helped so many generations for so long. Like CBA, you will be forever in our hearts. He was such a great man. I will remember him for the rest of my life as a kind, loving man devoted to god. Brother Al will be missed by the CBA community. He helped many people in his whole career at CBA. RIP Brother Al we will never forget you. Im so dissapointed that i didnt know you well but I think by what people say, you’re a great man! RIP! Brother Al was agreat man and worked here for over 50 years. He was the heart and soul of our school and he will be dearly missed. I have heard alot about brother Al. But only met him a couple of times and it is a shame I couldnt get to know him more. But what I knew of him, will never be forgotten. Brother Al was the face of our school CBA. He was here for over fifty years. Every one loved him. I barely knew him for a year but I do know that he was caring, loving and giving. I thank brother Al for inspiring me to do better in everything I do. He was a great man. God Bless Brother Al; he was the heart and soul of CBA. May he rest in peace. I graduated from CBA in 1979. As with all young people, my perception of peoples’ ages was quite a bit off. I probably thought Brother Al was nearly 80 back then. So imagine how shocked and thrilled I was when I found out my teenage view was so askew and Brother was still there in 2004 when I began sending my sons to CBA. My boys were going to get the same college guidance I did. It paid off greatly. As an aside, in later years, Brother took to giving the boys candy bars when they submitted their college acceptances and scholarships to him. My second son would hoard his letters until he found out if Brother had restocked the “good” candy. God bless you Brother Al. May your spirit continue to lead CBA over the next 150 years and more. I just learned of Brother Al’s passing. I am saddened, but at least I’m grateful that I saw Brother Al at CBA just two years ago. At that time, I took the opportunity to thank Brother Al for all the things he did for me as a teacher and mentor. I owe many of my successes to the discipline that I learned from Brother Al. He was the best teacher that I ever had, and, indeed, I have had a great many. My years as an undergraduate student at McGill University were successful mainly because Brother Al taught me (and all of my classmates, for that matter) how to study, and the importance of commitment. I will never forget him, and I remember him in my prayers. Brother AL was the most wonderful and dedicatated person who all of my boys will always remember. He gave 5 of my boys strength and guidance in many ways thoughout their time at CBA. I too always loved seeing him as I came to CBA and his smile always made me feel welcome. I and many others will miss him and remember him forever. Brother Al made a huge impact on my son’s (00) education and life; we still speak of him often. He will be remembered always. Brother Al lived the virtues he preached and was a great mentor for generations of CBA students. No matter how many years later graduates visited his office, he would always greet them with a smile and, amazingly, their first names. His passing is a great loss for the school and he will be missed. RIP. Nearly 30 years after graduating I was on a plane headed overseas when Brother Al passed. I tried to get back and visit him over the years, but life got in the way. No regrets, because his influence on my life was always there. I would NEVER have made it to where I am without him. I graduated from CBA with 4 FULL scholarships (academic) to college, this from a kid who entered the high school deeply troubled and under achieving. Few of us from the late 70’s will forget his killer “kung fu grip” and his catch phrase “hey…you’re losin!”. He worked long hours and provided a sanctuary of advice and mentoring while the country recovered from Vietnam. Brother Al is someone whom I shall never forget. He was my 7th grade teacher in 1954. He was a fine man that an example for many of us of what a man should be. Bless him. Rest in Peace Brother Al. I think all the other comments on this site are spot on. Don’t forget the all the funny sayings he could come up with at the drop of a hat. He was extremely motivating, very organized and an excellent role model for young men (and older men too) … especially when it comes to seeing a true Christian. Everyone loved Brother Al. You are definitely in the arms of Jesus now.